Permeate is everywhere this summer from trade shows to foreign trade missions. More and more, companies are reaching for milk or whey permeate, often labeled as dairy product solids, to economically improve formulations. Why? Because it works in a variety of applications with added benefits like better product taste and appearance, a clean label and reduced sodium. Permeate’s popularity is only going to increase after a recently-approved science-based standard for its identity, composition, safety and quality. The dairy community has been working together with the Codex Alimentarius Commission (CAC) to establish a Codex Standard for Dairy Permeate Powder over the past few years. As of July 2017, the standard was adopted by the CAC, fostering broader use of permeate. The U.S. dairy industry has a lot to offer as the world’s leading permeate supplier. Recently, the U.S. 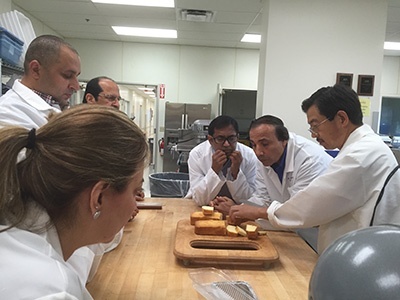 Dairy Export Council hosted a group of bakery/confectionery manufacturers from the Middle East on an inbound mission to the U.S. in order to study the advantages of U.S. permeate in products. The program included a hands-on training session at the Wheat Marketing Center to experience firsthand how well permeate worked in everything spanning croissants, cakes, muffins, pan bread, cookies, biscuits, flour tortillas and even frozen doughs. Uphold consumer-desired taste and appearance: Permeate is highly regarded for its ability to enhance the consumer-desired salty flavor of products, without interfering with intended flavors. Permeate also offers baked goods natural browning for a golden crust color and a pleasant caramelized aroma. To achieve similar functions without permeate often requires non-clean-label-friendly ingredient additions. Maintain a clean label: Permeate can be added to products for functional reasons, like emulsifying and browning, without adding unrecognizable ingredients to the product label. Permeate is a natural fit for a clean label because it is produced through the physical separation of lactose and minerals from protein and other solids from milk or whey. Reduce sodium: Permeate can reduce the sodium content while maintaining a desired flavor. In general, 10 to 11 grams of permeate will replace 1 gram of salt. It is recommended to balance the addition of permeate by reducing other ingredients such as flour, fat, eggs, granulated sugar and other carbohydrates. Permeate also had a strong showing at the 2017 Institute of Food Technologists (IFT) Annual Meeting and Food Expo. On display, this reduced-sodium protein Udon soup has 45% less sodium than similar products on the market, thanks to high-quality U.S. whey permeate. Explore more about permeate on ThinkUSAdairy.org.